Huntington High School freshman seminar program participants outside the building. A late summer seminar for a group of freshmen played out at Huntington High School in the days before the start of the current school year. The goal of the initiative was to provide students with essential tools to aid their transition into the building. This year’s seminar ran for three days from 9 a.m. to 1 p.m. District executives hope participation in the sessions pay dividends now and over the next four years. Business teacher Suzie Biagi and school counselor Lauren Brunoni led the multi-dimensional workshop during the program, which is now six years old. Several special guests visited the group and worked with the teenagers. 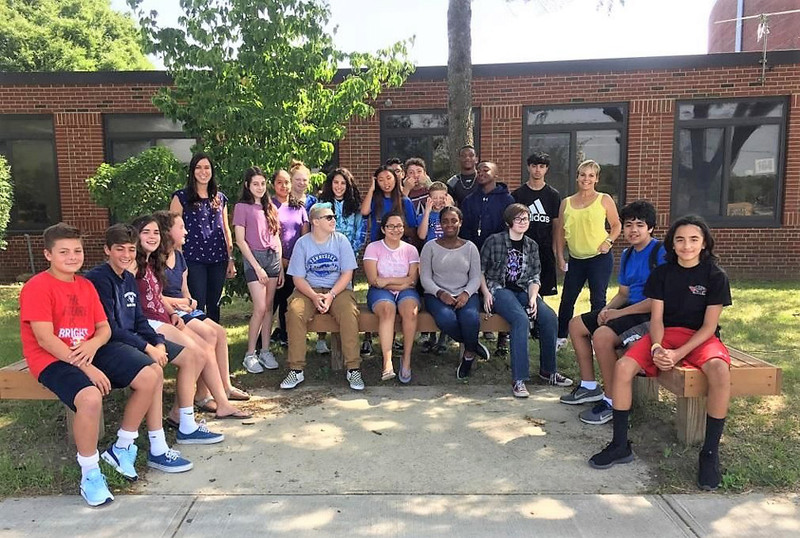 The plan is for Ms. Biagi and Mrs. Brunoni to meet with the students bi-weekly to discuss issues that might crop up and support them throughout the year along with quarterly “sit down” meetings with the whole group. Participants analyzed their personal learning style and the best way to study based on that style. “Goodie” bags were distributed to students, stuff with school related items. Students gave consideration to how they could use the bag’s contents to their advantage. The incoming ninth graders were also interested in hearing about the extracurricular clubs and sports teams available to high school students. The visiting alums said they had “great experiences” at Huntington High School. Ms. Biagi and Mrs. Brunoni are hopeful the new freshmen will similarly enjoy their time in the building.